This beach is a great place if you want to snorkel and maybe even swim with sea lions. It was here that I managed to take an underwater picture of a sea lion – and lots of pictures of those animals lazing on the rocks and the beach. La Loberia is located 2,5km from Puerto Baquerizo. You can easily walk here and if you’re lucky, you will see iguanas along the way. We didn’t, but that didn’t make La Loberia any less interesting. At first, we couldn’t even spot the sea lions since they were lying on the rocks. It’s the perfect camouflage! Eventually, we spotted them and then it didn’t take long to find some animals swimming near the shore. I kneeled down in the water and couldn’t believe how close they came. They are very curious creatures. To protect the animals, you should keep a distance of five meters. But with the sea lions being so curious, chances are high that they will end up swimming closer to you. If you are planning on snorkelling at La Loberia, you will need to bring your own gear. There are no rentals anywhere on this beach. 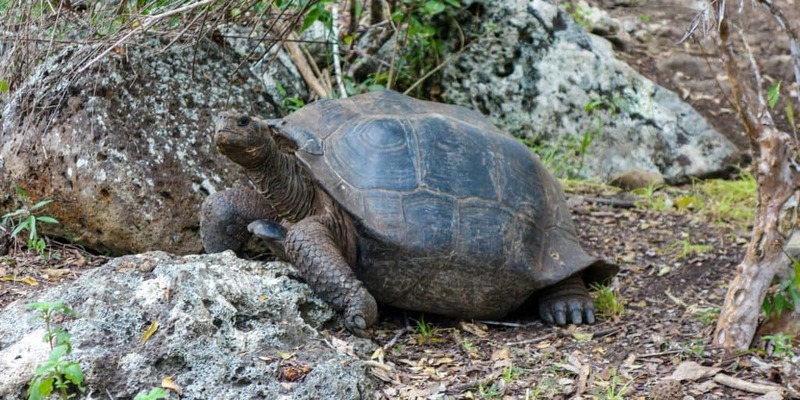 The Galapaguera is the best place on the island if you want to see giant tortoises. It is a breeding centre, but it is also open for visitors who can come in at any time and see those animals. The older turtles roam around freely, but once the females have laid their eggs, rangers will come and collect them and put them into an incubator. That way, they can ensure the survival of around 60% of the offspring, far more than would ever be possible in nature. Hopefully, this breeding centre will help the population of turtles grow. The giant tortoises can grow up to 1,5m in length and weigh 150kg. They are so large that they can even carry humans. Don’t try this yourself, but Charles Darwin used to climb on their back, clap them on their behind and see how far he could get before being thrown off. The answer, in case you were wondering, is not very far. The easiest way to visit La Galapaguera is by taxi. Ask the taxi drivers around town to combine a visit here with the El Junco Lake and the beach at Puerto Chino. The Centro de Interpretacion on San Cristobal is a great place to learn about the history of Galapagos, its different islands and ecosystems and the challenge involved with living on a remote archipelago. The islands were discovered by accident and, due to a lack of water, have not been populated for a long time. When settlers finally arrived, they tried to turn the place into a colony for prisoners. It doesn’t come as a big surprise that this experiment failed miserably. Buteven these days, life is still challenging due to various factors. 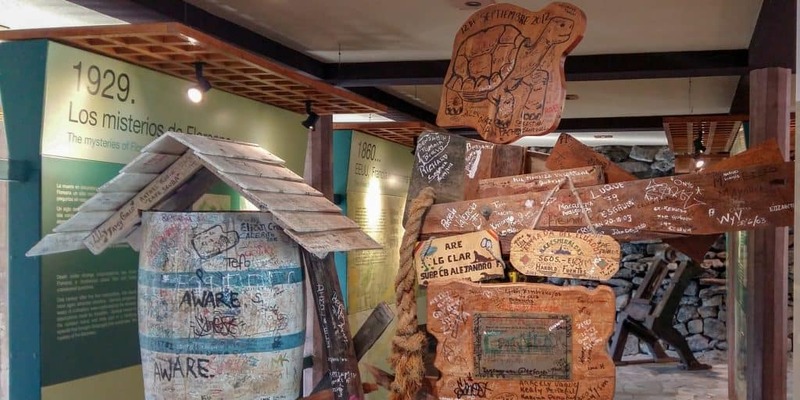 A visit to the interpretation centre is free of charge and, besides expensive guided tours, the best way of learning about the islands you are visiting. From behind the interpretation centre, you can keep walking to eventually get to the Cierro Tijeretas. 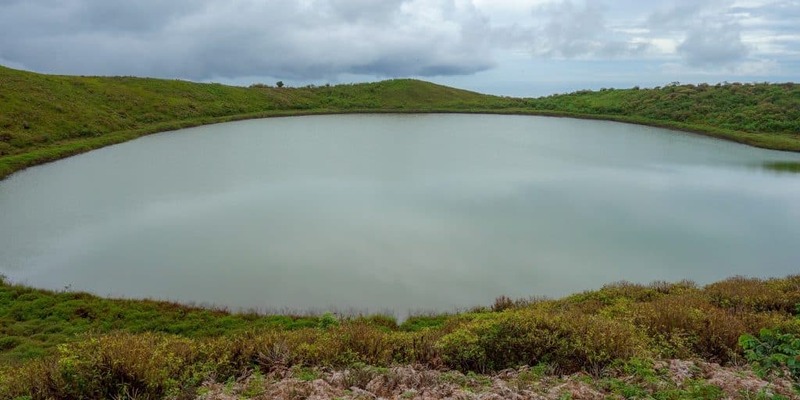 El Junco Lagoon is a crater lake in the highlands of San Cristobal, located at an altitude of around 700m. It is one of the few freshwater sources in the islands (if you go to the above mentioned interpretation centre, they have a section about the challenge of supplying all islands with freshwater) and is the reason that San Cristobal was one of the first inhabited islands. To get here, you need to either join a tour or hire a taxi. You can combine a visit to the lake with the Galapaguera and Puerto Chino. Your taxi driver will drop you off at a parking lot from where you have to climb steps to get to the top of the crater. The walk is not long, but in the humid heat we were soon sweaty and sticky. At the top, you can walk around the lake and enjoy a nice view all over the island. Try to come here on a clear day. While 700m is not very high, the mountain is often covered in clouds. Puerto Chino is a beach at the end of the road leading past El Junco Lake and La Galapaguera. Chances are high that you can find sea lions here, plus, the sand has some of the finest white sands on the island. I know it doesn’t look like it on my picture, since we weren’t very lucky with the weather, but this beach is white and powdery. It is just perfect (and sticks to your stuff for a very long time). When we came, sea lions were lying in the middle of the beach. They didn’t mind the visitors all around them. On the contrary. Eventually, they went on to chase a family away and then settled down on their towels. While they look cute, sea lions can be quite scary when they try to threaten you and the poor tourists had no choice but wait for the animals to get bored and go elsewhere. As mentioned above, a taxi driver can take you to Puerto Chino. Combine it with a trip to the El Junco Lake and to La Galapaguera. Make sure to negotiate with your driver about how long he is going to wait for you while you enjoy the beach. 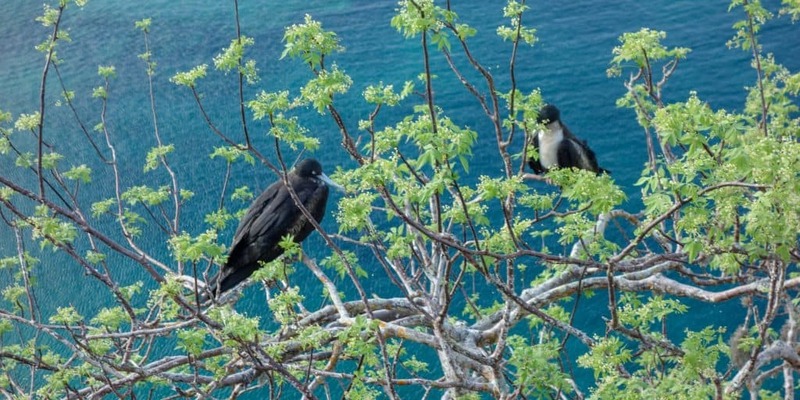 Cerro Tijeretas is a great place to see fregate birds. In case you’re like me and have no clue what these birds are, they are known for their giant red pouch that hangs undereath their neck. Google them and you’ll know why it’s worth looking for those funny animals. Unfortunately, that red pouch is rare to see and only appears in male birds during certain times of the year. We didn’t come during the right season, but climbing the hill was still worth it for the view alone. Cerro Tijeretas can easily be reached on foot from the city centre. Make sure to bring enough water as there is little shade along the way. If you are lucky, you also get to see blue-footed boobies but there is no guarantee. Playa Punta Carola is also known as Playa del Amor, supposedly because surfers fall in love with the breaks here. When I came, the water was completely calm. Not that I cared. 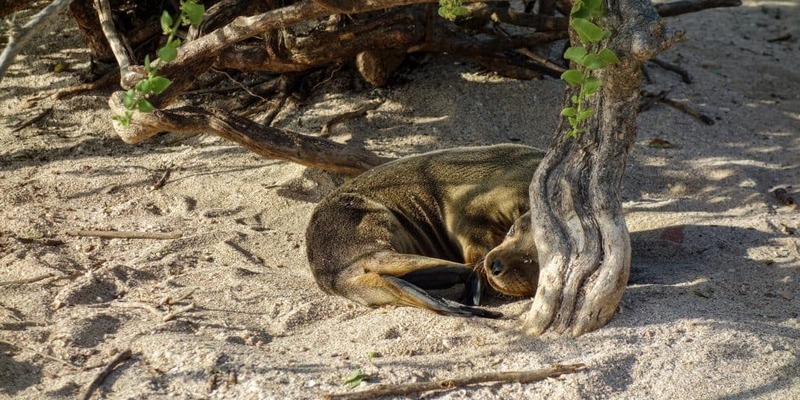 I was distracted by the sea lion baby that had curled up underneath a mangrove tree, and by the marine iguanas that were slowly crawling across the beach. Playa Punta Carola is the only beach on San Cristobal where I saw those iguanas. They are supposed to be at La Loberia as well, but we must have come at the wrong time of the year. Punta Carola made up for that. If you come in the evening on a clear day, this beach is also a great place to watch the sunset. 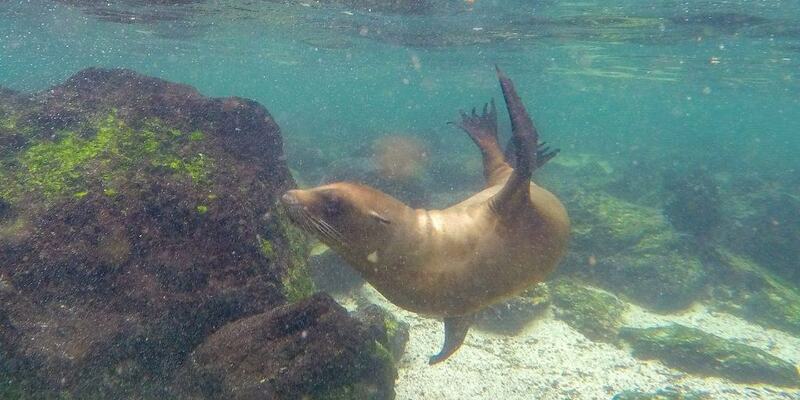 If you ask me for the best spot in Galapagos to see sea lions, I would name Puerto Baquerizo. 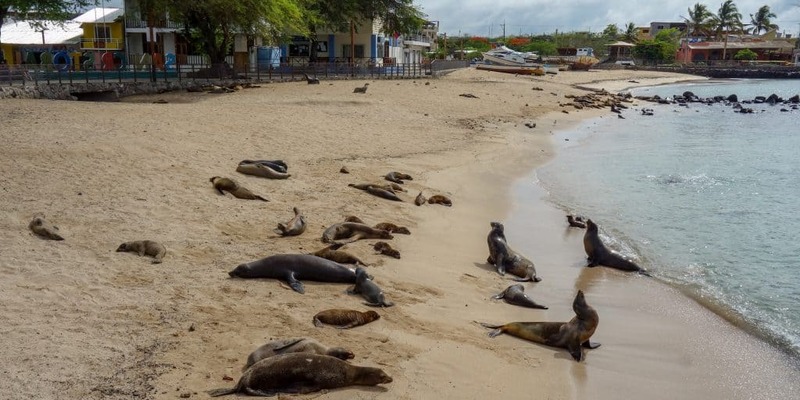 The sea lions have turned the harbour into their nesting grounds and I have not seen a single place on Galapagos where I could spot as many of these creatures. They are everywhere, on the boardwalks, on the benches, on the steps and, of course, on the beaches. Since we arrived in February, we saw lots of baby sea lions drinking from their mothers or frolicking in the water. We even saw them climb the boats that are anchored in the harbour. And they are not afraid of humans. Make sure not to touch them and to keep a distance anyway, but the sea lions are so used to our presence that they will lie down in the middle of a boardwalk and not move out of the way when someone needs to pass. 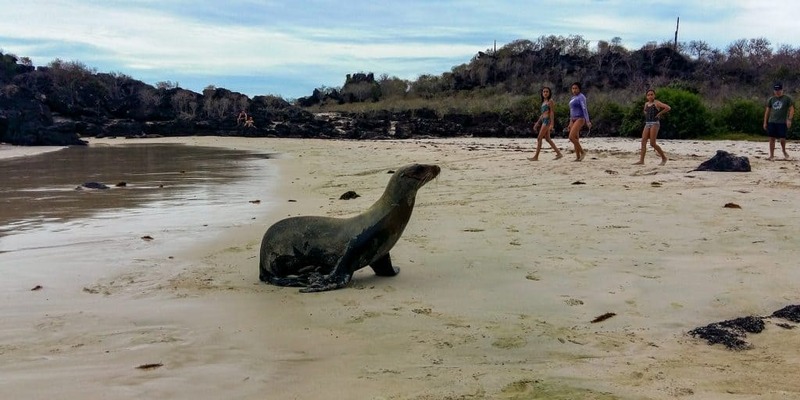 Have you been to Galapagos? Are you planning on going? I would love to hear from you about your travels in the comments below. 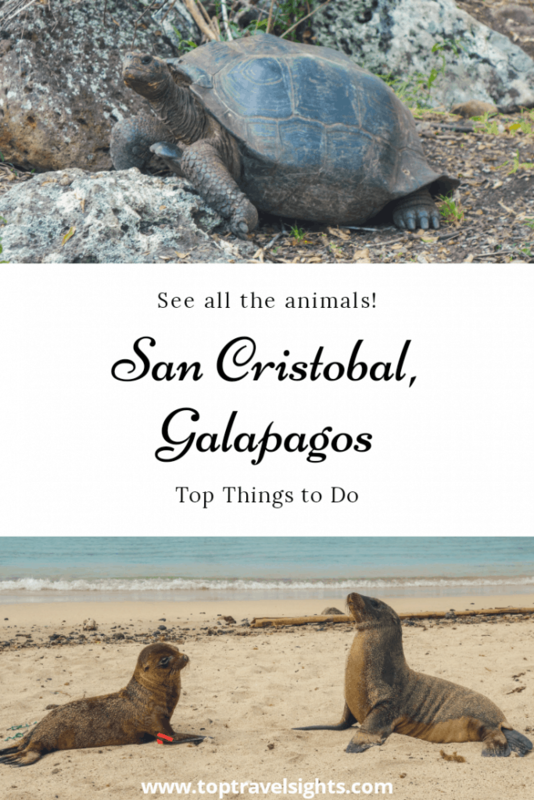 If you are still unsure about whether or not you can afford to travel to Galapagos, check out my budget guide to visiting the islands. Also, you might want to go on to other islands from here, so here is what to do on Santa Cruz and what not to miss on Isabela. The easiest way to go to Galapagos is to fly. All flights leave from Guayaquil, but there are also some from Quito with a stop over in Guayaquil. And while you’re in Ecuador, why not check out some of the other amazing things you can do in this country?